Learning about elephants is fun! Elemotion Foundation’s KIDS section is designed to teach children and young adults about elephant biology, their role in the ecosystem, and the unique qualities that make them so special. All games may be downloaded for free and were designed for use anywhere, at home or in the classroom. 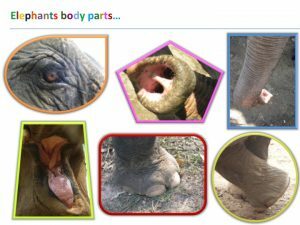 (ages 3-6) Designed by Australian Kindergarten teacher, Lauren Kate, this game is an in depth look at an elephant’s body parts. (ages 3-6) Many children are familiar with elephants in zoo or circus settings. This activity, designed by Australian kindergarten teacher Lauren Kate, is a play based game which explores elephants in their natural habitat. Scroll through our recommended book list for children’s literature.